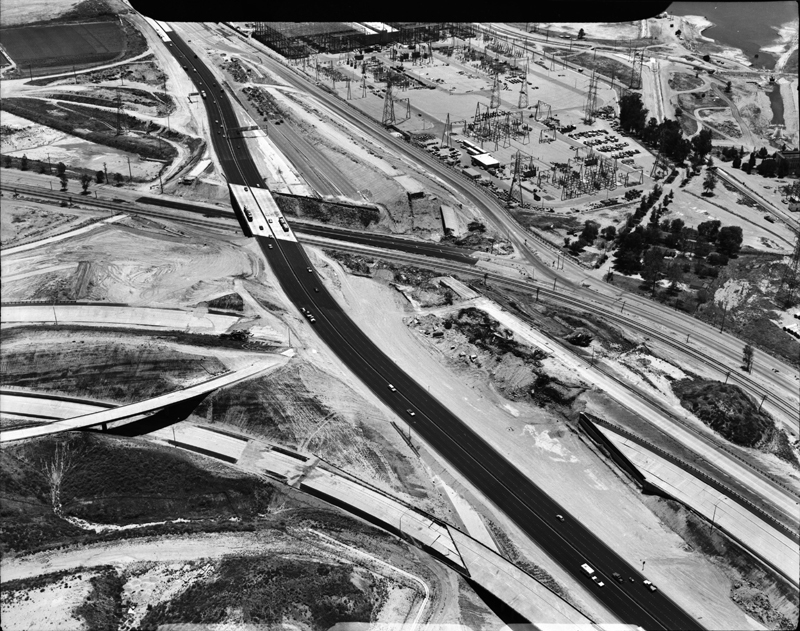 May 22, 1971 — Freeway damage and repairs in Sylmar after the earthquake of Feb. 9, 1971. Interstate 5 at the 210 Pasadena Freeway, looking south. I-5 runs up the middle of the photograph. It has been rerouted around the original alignment just to the right of it. The Van Norman Dam is in the top right-hand corner. At upper right is the L.A. Department of Water & Power's Sylmar Converter Station at 13201 Sepulveda Blvd. Sepulveda Boulevard runs parallel to I-5 at right. LW2548a: 19200 dpi jpeg from original 4x5-inch negative transparency purchased by Leon Worden.